Well doesn’t this recipe just scream LEFTOVERS?? And you would be right, My sister arrived yesterday with a turkey bought from Teseco – It should have been £32 but was reduced to £4.95. She obviously couldn’t leave it there for that price? So turkey dinner it was for us today but we still had some turkey leftover. We’ve had visitors every day this week and that meant a lot of time in the kitchen (mainly washing up for me than cooking) but I didn’t want to start slaving over a stove making a traditional risotto. I thought today was the perfect day to try oven-baked risotto and it was so easy. The mixture admittedly didn’t look that appealing before it was cooked but everyone soon ate their words afterwards – even one of my sisters, who describes chestnuts as rubber nuts! Pour the risotto rice into a medium sized oven dish - This meal doesn't grow too much during cooking so it doesn't have to be too big. Pour over the vegetable stock and add the bacon, chestnut and turkey. Remove the tin foil and cook again for a further 10-15 minutes until the consistency is how you like it. We had our quite dry and it was for more nibbling. This sounds absolutely lip licking good. 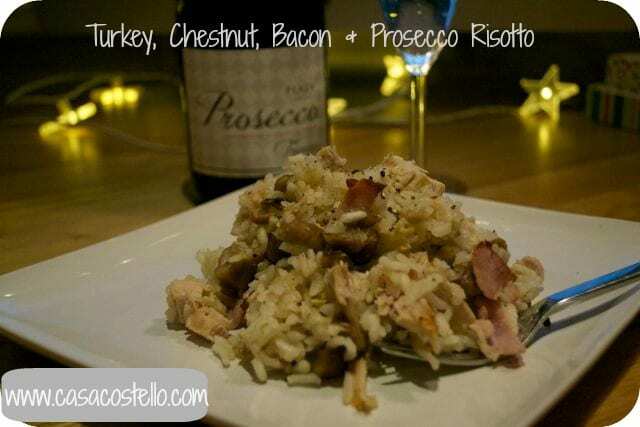 I love turkey, I love Prosecco, and I love risotto what a combination. I must try this. I haven’t made risotto in the oven might fare better than the ones I try on the stove that always stick to the bottom or become glue. Thanks for sharing. That looks lovely! Turkeys were def over ordered this year, my Tesco had them about 80% off Christmas eve! Looks great, an ideal way to use up leftovers.